04:45:00 Makes 20 servings, 1/20 recipe (68 g) each. How big a splash will this make at your kid’s party? We’re talking a tidal wave of fun complete with fluffy frosting, cookie decorations and colourful candies. 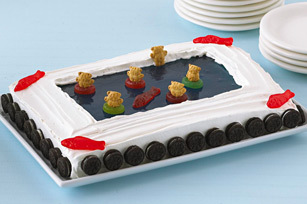 Dive in and celebrate with this party-perfect dessert. For easy removal of cake, line pan with foil before filling with batter. Serving Size Makes 20 servings, 1/20 recipe (68 g) each.